Simulation is an important technique to address issues of patient safety. We need to think of it as with a long-term view, as a career-long activity for all clinicians. Because the techniques are not completely dependent on expensive technologies it can be used in various forms in a setting whether high or low resource. The growth of simulation use has come largely from clinicians’ direct experience with it rather than from definitive evidence of its impact (which is hard to come by) or by any regulatory drivers. It has not been necessary to count the lives saved in order to convince many institutions to use these techniques. There is a saying so good that it is in both the Hebrew Talmud and the Muslim Quran that “whoever saves a life, it is as if he has saved all of mankind.” Based on anecdotes and the evidence that does exist we are pretty certain that many hearts, brains or lives have been saved directly and indirectly by the use of simulation. It is this spirit that motivates the many anesthesia professionals and those in other arenas of healthcare to continue their efforts to use these techniques to their maximum effect. Patient safety comes from using all available mechanisms to avoid harming patients while trying to cure or help them within the health care system. Simulation—defined as a “technique and not a technology”1 for creating and using interactive and immersive experiences that recreate or stimulate recall of real-world experiences—is a critical tool used to enhance patient safety.1,2 Simulation is useful in many ways, but in part because it allows one to do things that are impossible in real life. There is no risk to any patient, and, unlike real clinical care teaching, there is no pressure for efficiency. One can pause, stop, and start a simulation at will. Perhaps most importantly, simulation errors occur and can play out to their ultimate conclusion, whereas with a real patient, others would need to intervene to protect the patient. While many people think of simulation as involving computer technology and robotics, it is actually an ancient technique made possible by human beings’ innate ability to recall past events and imagine events that have not yet occurred. Because of these abilities, a number of mental activities that require minimal or no technology are in fact “simulations” they are available to everyone regardless of location, wealth, or technological savvy. Verbal Simulation (“What if”): An individual can pose a situation (true, fictitious, or both) to another person probing to describe both his or her own thoughts and actions. Often this is done more systematically than just telling the story. Role-playing: This occurs when one “assumes the role” of someone else, sometimes in an unfamiliar position. Role playing allows one to practice the actual thinking and communication with others. Encounters with (Standardized) patient actors: The role of the patient (or family member, or others) is played by an actor. The “standardized patient” is a specially trained professional whose experience and training allow for portrayal of diverse people and personalities. In addition, these individuals may be trained to evaluate or score the clinician about certain medical or interpersonal skills demonstrated in the encounter. Procedural training using food items: For many clinical procedures there may be no better simulator than food—either the animal part analogous to the human part, replicating the anatomy, or sometimes a non-realistic food item that has some useful characteristics. An example of the latter is the use of a watermelon to aid the training of novices in epidural catheter placement (the rind of the watermelon replicates the firmness of the ligamentum flavum and then provides an excellent loss of resistance when penetrated). Some of these simulation modalities can be enhanced when combined with a small amount of technology. Verbal simulations can be enhanced by showing diagrams or photos of monitor screen vital signs or patient anatomy. Certain inexpensive smartphone apps can show a monitor with a variety of moving waveforms, with the values changeable by a corresponding app on another person’s phone. Relying solely on verbal simulation may not address the complexities of real (anesthesia) patient care. As expected, there are no simulations with actors or students allowing themselves to be anesthetized solely for educational purposes. Therefore, there are some simple “technologies” (e.g., mannequin; monitor app) that have been very useful in low-resource environments. A few examples worth mentioning are the “Helping Babies Breathe” program, which uses a very simple mannequin (Laerdal Medical, Inc., Stavanger, Norway) that is essentially a simple, but ventilatable, head with the “body” made up of a special plastic bag that when filled with warm water expands to mimic a newborn’s thorax, abdomen, and limbs (https://www.aap.org/en-us/advocacy-and-policy/aap-health-initiatives/helping-babies-survive/Pages/Helping-Babies-Breathe.aspx). An extension of this simple technology is used for simulating post-partum hemorrhage and consists of a delivery “pouch” that can be worn by someone playing the mother. Both of these simple devices also come with a curriculum. The typical targets for these simple and relatively inexpensive devices are local birth attendants. More sophisticated, but still relatively simple, devices may be appropriate for hospital personnel in low-resource settings. For those with more resources there are a variety of mannequin-based simulators and task trainers of varying complexity. An exciting new set of technological simulation modalities are just beginning to emerge, offering types of “virtual reality” (VR) ranging from simple to complex. In one approach, an online “virtual world” is created on the computer screen replicating a clinical environment, with the primary participant in the simulation controlling an “avatar” on the screen which can interact with a patient, administer drugs and utilize supplies and equipment. 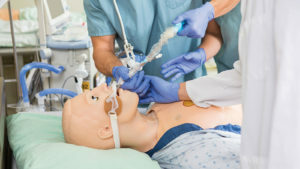 Currently one of the most advanced of these systems—SimSTAT™ (https://www.asahq.org/education-and-career/educational-and-cme-offerings/simulation-education/anesthesia-simstat) has been developed for the American Society of Anesthesiologists (ASA), which offers it to anesthesia professionals for a fee. A more challenging VR approach uses head-mounted displays, audio, and hand-held controllers to provide a fully interactive multiple-participant immersive patient care environment. Systems of this type are just becoming available for acquisition and use for teaching by clinical simulation faculty. Simulation is for all fields of health care, especially for highly dynamic areas like anesthesiology, intensive care, emergency medicine, and neonatology. The target audience for simulation are often experienced personnel, often involving teams composed of members from many disciplines or even whole work units. For such purposes, the goals of the simulation are typically only partially focused on the medical and technical details of patient care situations. Instead, they are primarily focused on dynamic decision making, including “crew resource management,” teamwork, ethical issues, and communication, including having difficult conversations with patients or families. Does Simulation Improve Patient Safety? Simulation is an important technique to address issues of patient safety. We need to think of its benefits with a long-term view, as an ongoing career-long activity for all clinicians. Because the techniques are not necessarily dependent on expensive technologies, they can be used in a wide variety of clinical settings whether high- or low-resource. The growth of simulation use has come largely from clinicians’ perceived benefit obtained via direct experience with it rather than from definitive evidence of its impact (which is hard to come by) or by any regulatory drivers. It has not been necessary to count the lives saved in order to convince many institutions to adopt these techniques. There is a saying so profound that it is present in both the Hebrew Talmud and the Muslim Quran that “whoever saves a life, it is as if he has saved all of mankind.” Based on anecdotes and the evidence that does exist we can be confident that many hearts, brains, or lives have been saved directly and indirectly by the use of simulation. It is this spirit that motivates the many anesthesia professionals and those in other arenas of health care to continue their efforts to use these techniques to their maximum effect. Adapted by the author from his presentation at the International Forum on Perioperative Safety & Quality, October 12, 2018, San Francisco, CA. Dr. Gaba is associate dean for Immersive and Simulation-Based Learning and professor of anesthesiology, perioperative, and pain medicine at Stanford School of Medicine. He is also staff anesthesiologist and founder and co-director, Patient Simulation Center at the VA Palo Alto Health Care System. Dr. Gaba receives an annual honorarium from the Society for Simulation in Healthcare as the founding editor-in-chief of the peer-reviewed journal Simulation in Healthcare. Dr. Gaba receives an annual honorarium from the ASA as a member of the Simulation Editorial Board. Dr. Gaba receives royalties on the sale of the textbook Crisis Management in Anesthesiology. Gaba DM. The future vision of simulation in healthcare. Simul Healthc. 2007;2;126. Rall M, Gaba D, Dieckmann P, Eich C. Patient simulation. Miller’s Anesthesia (8th edition). Edited by Miller R. Philadelphia, Saunders, an imprint of Elsevier Inc., 2014. Gaba DM: Simulations that are challenging to the psyche of participants: how much should we worry and about what? Simul Healthc. 2013;8;4–7. Barsuk JH, McGaghie WC, Cohen ER, et al. Simulation-based mastery learning reduces complications during central venous catheter insertion in a medical intensive care unit. Crit Care Med. 2009;37;2697–2701. Barsuk JH, Cohen ER, Potts S, et al. Dissemination of a simulation-based mastery learning intervention reduces central line-associated bloodstream infections. BMJ Qual Saf. 2014;23;749–56. *Personal communication with author, unpublished data.